Unable to connect to QuickBooks. Make sure QuickBooks is running on this machine and is logged in as Admin to the Company file. Make sure QuickBooks Company file is in Single User Mode and try again. 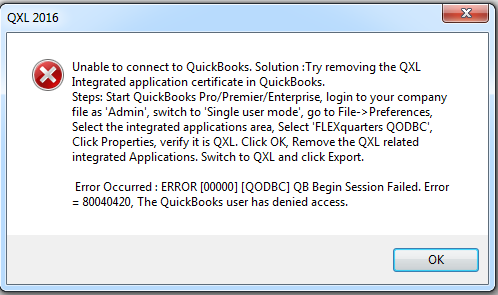 or Try removing the QXL Integrated application certificate in QuickBooks. Steps: Start QuickBooks Pro/Premier/Enterprise, login to your company file as 'Admin', switch to 'Single user mode', go to File->Preferences, Select the integrated applications area, Select 'FLEXquarters QODBC', Click Properties, verify it is QXL. Click OK, Remove the QXL related integrated Applications. Switch to QXL and click Export. Unable to connect to QuickBooks. 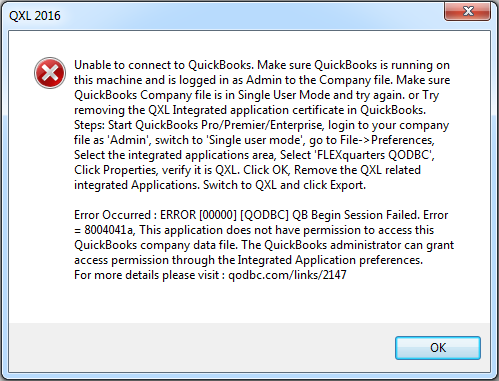 Solution: Try removing the QXL Integrated application certificate in QuickBooks. Steps: Start QuickBooks Pro/Premier/Enterprise, login to your company file as 'Admin', switch to 'Single user mode', go to File->Preferences, Select the integrated applications area, Select 'FLEXquarters QODBC', Click Properties, verify it is QXL. Click OK, Remove the QXL related integrated Applications. Switch to QXL and click Export. Error Occurred: ERROR  [QODBC] QB Begin Session Failed. Error = 80040420, The QuickBooks user has denied access. Error Occurred: ERROR  [QODBC] QB Begin Session Failed. S0000 00000 [QODBC] QB Begin Session Failed. Error = 8004041d, This application is not allowed to log into this QuickBooks company data file automatically. The QuickBooks administrator can grant permission for an automatic login through the Integrated Application preferences. Please make sure QuickBooks is running on this machine and user is logged in as Admin to the Company file. Also, make sure QuickBooks Company file is in Single User Mode and try to connect again. It should pop-up Data Access Certificate on QuickBooks, Please accept the Certificate & test again. 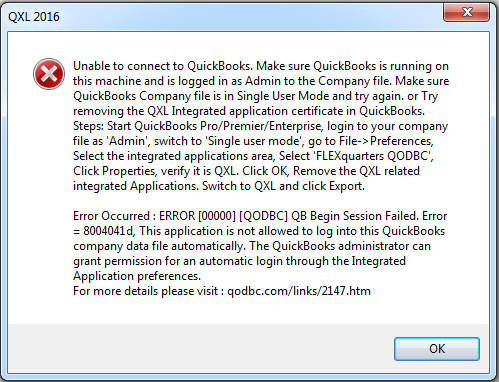 Try removing "Flexquarters QODBC" from Integration Application in QuickBooks. After performing above steps try to connect again.